Grandfather is at the center of the photo. 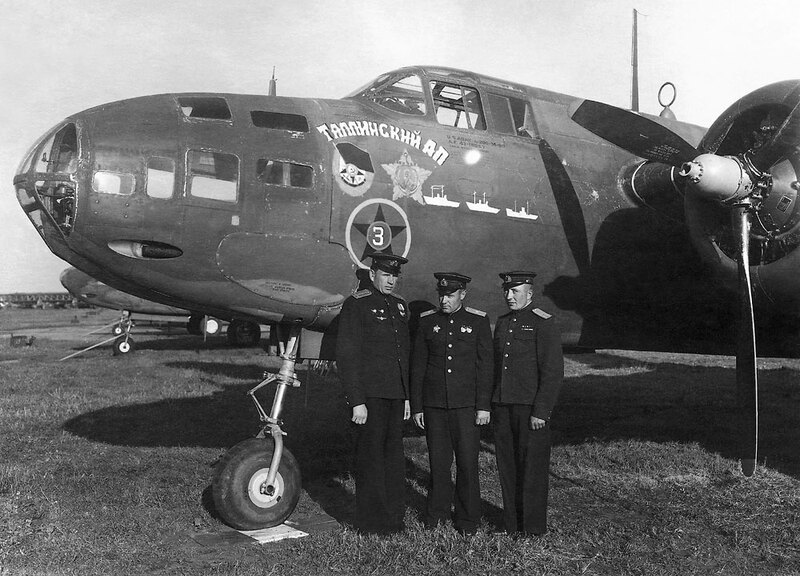 The writing on the plane says it’s an American Boston A-20G, which were supplied to the USSR under Lend-Lease. When we got Bostons we were surprised with unprecedented level of comfort - they were warm! We could fly without fur shoes and fur coats which we all used to. But when we got involved into actions we’ve found that Bostons are too ready to burn. Technicians investigated why and found that heating was provided by a gasoline stove fed by a pipe running through the entire machine. A bullet or a shell fragment and the machine is down. So we dismounted the whole heating system and got our fur boots with sheepskin coats back. Future of BPM: Replacement or Extension? According to the experts, the concepts behind the acronyms aren’t exceptionally new - it’s evolutionary integration of related technologies: BPMS, BAM, BRE, CEP, ACM… Looks like someone decided it’s time to put new labels over the old BPM/BPMS. I’m not personally convinced that the market will accept this labeling game. Attempts to announce the “post-BPM” solution was made in the past (Intalio) and are made today (Metasonic) without much success. This time the heavyweights are in play however. We both do not agree with the fact that BPM is dead… or that BPM is tired. In fact, innovations associated with the clouds, event-driven analytics, case management, mobile applications and social networks fed by innovations in the field of BPM with an intensity that we have not seen for years. This time it’s about “in addition”, not “instead” hence the talk about “the death of BPM” is either speculation or provocation. And this is very good actually - let’s not start it from scratch once again: TQM, reeingineering, BPM… It destroys the market as potential customers feel uncertain. What’s the point of implementing a new acronym if the previous one - pushed by the same consultants - was declared obsolete so easily? Now when we position the post-BPM as an extension, it makes the late majority customers realize that the “basic BPM” is a task of yesterday, not tomorrow. Plus, tomorrow promises many fascinating and useful things. One of our BPM project’s sponsor said at the very beginning, when we discussed the possible project: “my employees don’t need a control, they need help”. I argued at the moment, but later I realized that he was right. What do we mean when we are talking about controlling a business process? Should we consider paranoid participants suspecting that the ultimate goal is to control them? After all, the prevailing view of a process management is this: let’s draw a process diagram and make everyone do what’s written in a box assigned to him. And a manager will get a nice picture: the speed of the corporate machine is running and the amount of fuel it consumes. But the real life is much more complicated: it’s always about a network of processes communicating via data, signals and messages. In the absence of computer-aided control it’s people who control these processes: they watch the bills to be paid, the orders to be delivered timely and in accordance with specs, the capacity and materials to be synced with orders accepted. They also deal with non-standard situations: customer revoked the order or paid several bills with one transactions, supplier changed delivery date etc. These are complicated tasks. Really complicated. And now comes a business process specialist who doesn’t know how to do anything yet knows how to do it better. But if he only knows how to draw a primitive workflow then it’s no use. A small company reselling “cool stuff”: gadgets, special gifts, designers’ accessories for bathrooms etc. A group of processes “Assortment Management”: several employees permanently monitor internet, visit trade shows, get into competitors’ stores looking for new ideas, brands, suppliers. On one hand, due to the business profile, the assortment must be updated by trendy things regularly but on the other the product line shouldn’t be too large, it must be trimmed also regularly. These several people assess up to a thousands of candidates per month. The company developed a three-stages filter: first an express assessment made by an expert who throws away most of the income. Then negotiations with vendor, logistics work-out and possible profit estimate. And finally all ideas that passed first two stages are ranged once per month and the top candidates are selected for sample purchasing with the total available budget in mind. In parallel, the whole current assortment is analyzed also monthly in terms of diversity, profitability etc. A lot of aspects are taken into consideration both during selections and assortment revsions. E.g. a number of items within a single assortment group shouldn’t be neither too small (a buyer doesn’t trust when there is no choice) nor too wide (the buyer becomes confused and goes away). The assortment is limited by the physical dimensions: all goods should be placed on the shelf which is limited in size. And other completely informal things like an intuition saying to the expert that particular good is going to be a top-seller. But to start with, as was shown in the previous post, when the budget is constrained the purchase decision may only be made on the basis of the whole set of candidates and no way in the frame of a single candidate assessment process. Next, what’s the use of this scheme if all steps are performed by a single employee? This is pure micromanagement. Is it the issue here to control the sequence of tasks? Of course not - the issue is to control the bunch of processes running simultaneously and asynchronously: hundreds of first stage assessment instances, dozens of second stage assessments, selection into and trimming from the assortment. What we need for this task is not a workflow but a complicated enough interprocess collaboration. People don’t want to be controlled, they need help in controlling really complicated processes. If you give it to them then there’d be no opposition, people will gladly use a BPM system. Verified by practice. Now tell me - who would not accept such a helper? Besides the BPM robot is safe because it obeys the laws. Not the Asimov’s law however. A robot will never be able to do what you are able to do. A robot will do only a part of what you are doing. A robot will do only a part that you won’t like to do yourself.